Top-selling author E. D. Baker delights fans with a brand new fairy tale world full of humor and charm. In this new stand-alone fairy tale, Princess Annie is the younger sister to Gwen, the princess destined to be Sleeping Beauty. When Gwennie pricks her finger and the whole castle falls asleep, only Annie is awake, and only Annie—blessed (or cursed?) with being impervious to magic—can venture out beyond the rose-covered hedge for help. She must find Gwen’s true love to kiss her awake. But who is her true love? The irritating Digby? The happy-go-lucky Prince Andreas, who is holding a contest to find his bride? The conniving Clarence, whose sinister motives couldn’t possibly spell true love? Joined by one of her father’s guards, Liam, who happened to be out of the castle when the sleeping spell struck, Annie travels through a fairy tale land populated with characters both familiar and new as she tries to fix her sister and her family...and perhaps even find a true love of her own. I love fairy tale retellings and this one looks like it has such an interesting concept!! 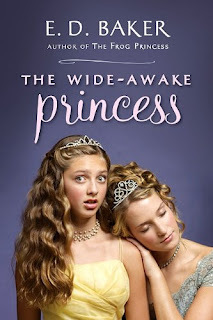 I've been interested in reading this author's Frog Princess series ever since I found out that Disney's "The Princess and the Frog" was based on those books! What are you waiting on this week?? One more week to enter my Giveaway for "The Wish Stealers!"!! Athena Smith, the costume curator for a Chicago museum, is elated to finally see the legendary vintage gowns worn by a city icon, Bertha Palmer. But the gowns are owned by the Clayworth family, who are not on good terms with Athena's family. The Clayworths just fired Athena's father from their company for unknown, but scandalous, reasons. So Athena has little hope of gaining the gowns for an exhibition at the museum. While looking at the gowns, she inhales a toxin which acts as a truth serum. Wh...more I was lucky enough to win this book in a Goodreads First Reads contest. I had heard great things about the first book in this series, and jumped at the chance to read the sequel. The book is a funny but heartfelt story of a young Italian American woman trying to find herself against the backdrop of her large overbearing family and the family custom shoe business. Valentine and her grandmother had been partners in running the Angellini Shoe Company as well as roommates in the apartment above the business. So Valentine feels a major blow when Gram gets remarried and moves to Italy with her husband. Now Valentine can't hide behind her cozy life with Gram and also take a backseat as Gram runs the company. She has to step up and figure out what she wants from life and the business. Valentine is used to letting her family define who she is and what she does, and she doesn't make her own life for herself. When Gianluca, her grandmother's new stepson, makes his feelings known to her, she has the opportunity to step up and build her own life, not do what she's expected by her family. But will she try to make the change or will she keep to her steady, predictable pattern? 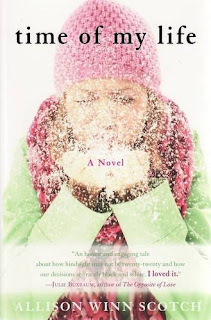 I loved all the vivid characters in Valentine's family and her friends June and Gabriel. These characters and Valentine's relationships with them were really what made me enjoy this book. However, there were aspects of the novel that I didn't like. I really had trouble with the age difference between Valentine and her love interest, Gianluca-18 years!! She is 34 and he is 53. I'm not really a fan of this type of romance, but if that interests you, you will love this story! Another reason why the age difference didn't work for me is because Valentine is already admittedly immature. Then when she becomes infatuated with a 53 year old, it reinforces the idea that she wanted a father figure- someone else to take care of her and make her decisions for her. There was a tone of melancholy throughout the book, especially in the last third, because the theme of cheating was prevalent. Three married couples deal with cheating in this book, and it started to get sad, especially because her father's affair was mentioned over and over as a hurdle for their family. Bottom Line: The book is written very well, with great plotting and pacing, the characters are deep and developed. If you like books with a full cast of character, with real life struggles, then this is the book for you!! What are You Reading on Mondays is a weekly event hosted by Sheila at One Person's Journey Through Books. It's a great way to show everyone what you are reading this week, and maybe what you just finished or are planning to read, too! What are you reading this week?? In My Mailbox is hosted by The Story Siren, and is a way for everyone to show off their new books for the week, including those bought, swapped, won, or received for review. I won this in a contest from Laura at Laura's Reviews!! There are so many great new books about the Bronte Sisters out right now, and this one looks so good!! Check out Laura's site for a great Bronte Sisters challenge! Thanks, Laura! This is book #3 in the Vampire Academy series! I loved the first book in this series, but I haven't had a chance to read the rest of the books yet. What did you receive in your mailbox this week?? Wow! This book looks amazing!! It's got a bit of everything and the cover is absolutely gorgeous!! Remember to check out my new Giveaway for "The Wish Stealers!"!! "The Wish Stealers" Review and GIVEAWAY!! Giveaway has ended! Congratulations to Lindsay's Photography! And thanks to all who entered!! 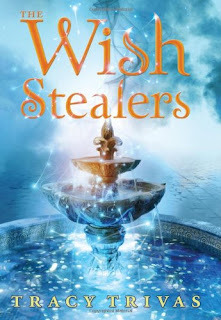 I'm giving away my copy of "The Wish Stealers" to one lucky reader! Please see the end of this post for details! Griffin Penshine makes wishes every chance she gets. Then a slightly scary womand gives her a "lucky" penny and box, and curses her as a wish stealer. Inside the box are eleven pennies, all stolen from a wishing fountain when the old woman was just a girl. They are all labeled with the original wish, and some even have the names of the wishers. Griffin has to return these wishes to their owners or none of her good wishes will ever come true again, only her negative ones. This is a really sweet book for middle grad readers. Griffin is a great lead complete with flaws. She isn't perfect, she makes mistakes like we all do, but she learns from them and tries hard to make them right. Griffin has an arch nemesis at school named Samantha, who always makes fun of her. Samantha is jealous of Griffin's friendship with Garrett, the cutest boy in their class. Griffin's relationship with Garrett is full of the ups and downs of real friendship, including some hints at a first crush. Griffin learns a lot about wish stealers-those who make fun of others' dreams and try to discourage them. She even finds herself being a wish stealer when she gets really angry with Samantha, even though she later regrets it. But as she tries to give all eleven wishes back to their owners, she learns even more about making your own wishes come true, not with luck, but by working for it. There are lots of characters in this book and it's great to see it all come together nicely. Each chapter ends with a great quote about wishes. I've never seen chapters end with quotes, I've only seen quotes at the beginning of chapters. But this way was great because yhou could tell how the quote worked perfectly with the rest of the chapter. Bottom Line: This was a fantastic book for the young and not so young, with awesome advice for everyone in how to hold onto your wishes and dreams. I'm sorry to international readers, but this contest will be for the US only. You must be a follower to enter, just leave me a comment with your email address so I can reach you if you win! Winners will have 5 days to contact me after I send the email, otherwise another winner will be chosen. Winner will be chosen via random.org. I won this ARC from a Goodreads Firstreads contest, it was sent to me by Harper Collins. 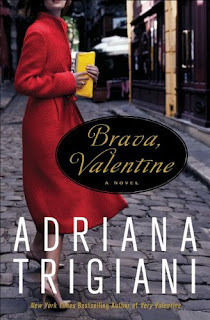 I've heard great things about the first book in the series, "Very Valentine," and can't wait to read this one! Thanks to Goodreads and Harper Collins!! I won this hardback from Blogging Mama Andrea and the book was sent from Simon and Schuster! Thanks Andrea and S&S books! 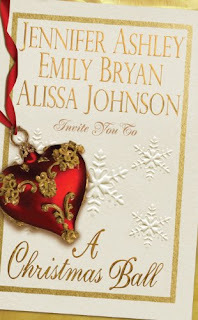 I've already read this one and it was so cute! Review coming up shortly!! GIVEAWAY ALERT!! I'm now having a contest for "The Wish Stealers"! Check it out for your chance to win!! Athena Smith, the costume curator for a Chicago museum, is elated to finally see the legendary vintage gowns worn by a city icon, Bertha Palmer. But the gowns are owned by the Clayworth family, who are not on good terms with Athena's family. The Clayworths just fired Athena's father from their company for unknown, but scandalous, reasons. So Athena has little hope of gaining the gowns for an exhibition at the museum. While looking at the gowns, she inhales a toxin which acts as a truth serum. Wh...more Esme Worthington only reads about adventures in her studies of antiquities, including the legendary Pandora's box, while she remains a prim and proper miss. However, that is before her study is ransacked by those searching for clues to the key to Pandora's box. Fielding Grey, a treasure hunter himself, just wants to steal the box back from the criminals, but his heart won't let him leave Esme behind. He rescues her, and takes her along on his adventure, but she becomes more than a handful when the temptation of the box becomes too great for her. She opens it and is cursed with lust...which is sure to be directed right at Fielding. 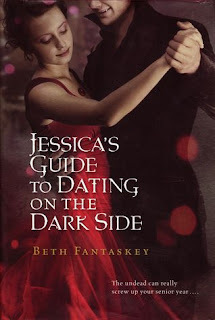 This book is definitely for romance readers who like a lot of action and adventure with their love story on the side. This isn't the type of story that I love, so it was only ok for me. It was a quick, fun read, but there just wasn't enough between the hero and heroine to really grab me. Fielding was very focused on his work, not exactly a tender romantic. Sometimes I felt like he only tolerated Esme because he was a good person and didn't want her to be hurt, not because he loved her or anything. And Esme only seemed to feel lust for Fielding. Esme was a very intelligent heroine, I just wanted her to have more self esteem. She never believed that someone like Fielding could be attracted to her. So while the adventure was there, I felt like the romance was lacking. Bottom Line: If you like a treasure-filled adventure with a mystery to solve, with a little dash of romance, this is the book for you! Since her sister’s mysterious death, Persephone “Phe” Archer has been plagued by a series of disturbing dreams. Determined to find out what happened to her sister, Phe enrolls at Devenish Prep in Shadow Hills, Massachusetts—the subject of her sister’s final diary entry. After stepping on campus, Phe immediately realizes that there’s something different about this place—an unexplained epidemic that decimated the town in the 1700s, an ancient and creepy cemetery, and gorgeous boy Zach—and somehow she’s connected to it all. 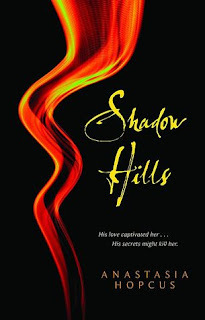 But the more questions she asks and the deeper she digs, the more entangled Phe becomes in the haunting past of Shadow Hills. Finding what links her to this town…might cost her her life. I'm intruiged!! Looks full of secrets and a few chills!! I can't wait! 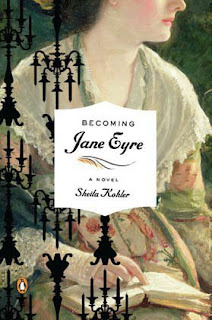 What are You Reading on Mondays is a weekly event originally hosted at J. Kaye's Book Blog. The event is now hosted by Sheila at One Person's Journey Through Books. It's a great way to show everyone what you are reading this week, and maybe what you just finished or are planning to read, too! Sooo good! My review is coming soon! I know, it's February but I'm still reading Christmas books!! I won this awesome book from Karen at For What It's Worth!! She also sent along some beautiful monogrammed stationery, stickers, and a bookmark, all with my initial :) Thanks, Karen!! 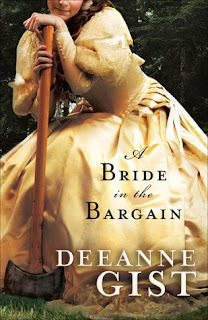 I won this fantastic book from Rae at Caffeine and Romance and the author, Deeanne Gist! They also sent along a lovely pin from Dee's Circle of Friends:) Thanks so much, Rae and Deeanne!! I have been waiting to read this one from a debut author! I've heard such great things about this romance! What did you receive in your mailbox this week? Athena Smith, the costume curator for a Chicago museum, is elated to finally see the legendary vintage gowns worn by a city icon, Bertha Palmer. But the gowns are owned by the Clayworth family, who are not on good terms with Athena's family. The Clayworths just fired Athena's father from their company for unknown, but scandalous, reasons. So Athena has little hope of gaining the gowns for an exhibition at the museum. While looking at the gowns, she inhales a toxin which acts as a truth serum. Wh...more Athena Smith, the costume curator for a Chicago museum, is elated to finally see the legendary vintage gowns worn by a city icon, Bertha Palmer. But the gowns are owned by the Clayworth family, who are not on good terms with Athena's family. The Clayworths just fired Athena's father from their company for unknown, but scandalous, reasons. So Athena has little hope of gaining the gowns for an exhibition at the museum. While looking at the gowns, she inhales a toxin which acts as a truth serum. What truth does she spill? Athena still has feelings for Drew Clayworth, her high school sweetheart. 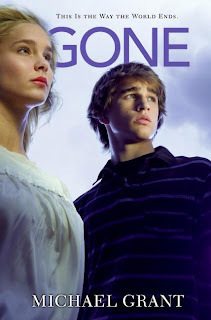 Will Athena and Drew be able to overcome the secrets in their past and their current family feud to fall back in love? 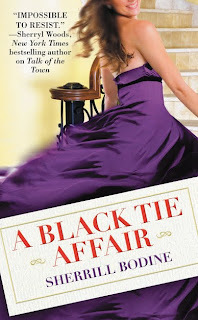 I won this book through a Goodreads Firstreads contest, and the reason that I wanted to read this book is the fashion aspect of the story. The curator of vintage fashion and costume at a museum is a fascinating job to me. Athena and her sisters also run a vintage couture boutique! These aspects of the book are very well done and well researched. It took awhile for me to see any chemistry between Athena and Drew, but once I did, they made a great couple. I thought it was cute that Drew and his brothers were considered such eligible bachelors. But otherwise, the leads weren't that interesting, I wanted to know more about them. I was a little confused and bewildered at the beginning of the story by all the different characters. There were so many names to keep track of, I had to keep flipping back to previous pages to find out who was who. Once I got their names straight, I really enjoyed Athena's sisters, Diana and Venus (don't you love the Greek myth theme?) They both seemed so feisty, and even though I'm sure they will both get their own books, I wanted to see more of them in this book too! The story seemed more like a madcap mystery than a romance to me, with a little bit of romance on the side. Think of an episode of "Bones" or "Castle." There were really three (3!) mysteries to solve: Who stole the dresses? What broke up Athena and Drew when they were teenagers? Why was Athena's father fired from the Clayworth's company? Bottom Line: I wanted to read this book because of the vintage fashion theme, and in that regard, this book delivered. However, I felt like the story and characters weren't quite as spectacular as all the vintage gowns. 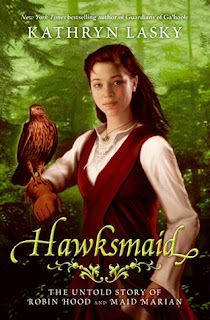 "Hawksmaid: The Untold Story of Robin Hood and Maid Marian"
She’s the headstrong daughter of Nottingham’s most famous falconer. But for Matty, hawks are more than family—they are her destiny. She can hear their thoughts, speak their language, and sense their every wingbeat. 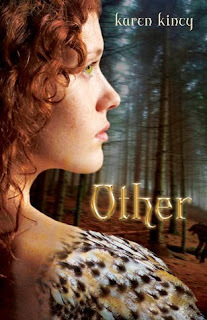 When Matty finds Marigold, a golden-eyed merlin abandoned in the wild, their connection is instant and magical. Marigold becomes Matty’s closest winged companion and her fiercest ally under the tyranny of Prince John and the sheriff of Nottingham. It’s up to Matty, Marigold, and their old friend Robin to save England. A fantastical twist makes this a legendary world of royalty, daring adventure, and deadly peril that will appeal to fans of Gail Carson Levine and Shannon Hale. Newbery Honor author Kathryn Lasky soars to magnificent heights in this bold tale of bravery, romance, and the untold legend of Maid Marian and Robin Hood. This looks like just the type of story that I love!! A strong heroine, an adventure, a romance, what's not to love?? And written by a great author too! I can't wait to read it! What are you waiting for this week?? I will be sending an email out to the winner for your mailing address. a HUGE thank you to everyone who entered!!! I will be starting a new contest ASAP, as soon as I figure out a book to give away! !